The Vertical ST bindings are the new best-selling version of the classic Comfort series. Dynafit engineers combined strength and lightness to make this durable binding that securely holds your boot to your ski. Great for all around touring and equipped with resort-friendly brakes, the Verticals are still the standard that other tech bindings are measured against. Rotating heel piece offers the choice of two riser heights in addition to flat, which is easy to manipulate with a gloved hand or pole. Release values range from 5-10 for both lateral and vertical (forward) release, which is plenty for most mere mortals. Lift plates under the heel and toe transfer power across a wide area while providing torsional rigidity and control. Lock your toe down with the lever to make sure your foot stays in while skinning, and remember to unlock before you ski for releasability. 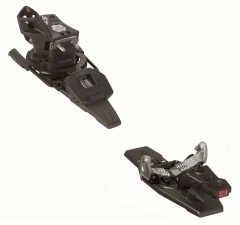 92mm wide brakes feature a glide plate to ensure a smooth lateral release while keeping on good terms with ski patrol. Equipped with a crampon slot to help follow those greasy skin tracks, if you insert the ski crampons sold separately. ** Note the brakes only come in one size (92mm), which is fairly skinny by today's standards. If you plan to use these on fatter skis, you'll have to go brakeless which saves around 120 grams per stride and 240 grams per hop turn. The classically designed Vertical ST will save you $50 and 20 grams (0.7 ounces) over the redesigned Radical version. For this price, you are limited to smaller brake sizes and will opt out of bonus side impact protection provided by the Power Towers on the Radical toe pieces. However if you plan to go brakeless or just prefer tried and true design with consistent riser adjustment to the sometimes fiddly Speed Step climbers, these are great choice. See our article Dynafit Radical vs Vertical for further comparison, but you won't be disappointed either way. I’m looking for a replacement heel riser or total heel piece replacement. Trying to twist into hike, I blew out a piece of the plastic top sheet of the Vertical heel pieces with the triangular prism riser. White. Hi Brian, you can fix that with the B&D comfort plates and volcanoes. Alternately, you can turn in your working parts for store credit. Do you sell toe pieces for Vertical ST ? I need a set. Hi Ken, the Vertical toe supply has dried up, but you can make one with a Speed Turn toe and a Vertical ST toe plate. Or just use the Speed Turn toes. I've been super happy with these bindings. I've put 50+ days on them in the last couple years. Regrettably that has involved some inbounds usage too, and while I haven't taken them through the terrain park they have held up greatly to mild amounts of airtime. I love the ability to remove the brakes, which is a little more difficult that I'd read in other places and typically works out to be a two to three beer job each time I try. I have my skis set up with inserts so these bindings have been on skis with a waist of 88 up to 112 and I currently have a megafat ski that is screaming at me to try them out on that. I have no doubts they will do well. I knew I wanted a pair of Dynafit Vertical bindings 5 years ago. They have far exceeded my expectations for touring capability, skiing performance and reliability. A good, simple Dynafit design without all the fancy stuff inherent in the radical design. I've trusted these bindings on a lot of skis and Dynafit has replaced the heel risers, so they are still going strong. If not beaten too much, the rotating heel piece will stay in position, and if it does start going both ways, you should be able to pack it with something. Few places still stock these so I'd get em if you can, though the brakes for wide skis may be tricky to source.